This article first appeared in an Issue of the Human Infrastructure Magazine at Packet Pushers. You can signup to receive the magazine by email and for free by subscribing here. Software Defined Networking & self-driving cars are closely related because they are automated systems. When automated systems go wrong who takes responsibility ? Networks operate in declarative mode. We configure policy (declare) into our various devices and then let the automated systems do the rest. This “hands off” approach is quite different from the imperative model used elsewhere in IT of “do exactly this and nothing else”. I wonder if this basic difference is why network technology is poorly understood by others. And the reverse direction is also true. More importantly, this gap leads to Moral Hazard around network monitoring. An an industry, networking does monitoring badly. The most pervasive problem with network management is that operators don’t install tools to validate the integrity of the network. Why ? Partly because they are based on assumptions made 30 years ago and partly because building distributed autonomous systems is very hard. Computer science has advanced to make distributed systems easier with new languages and programming models but networking has been slow, incredibly slow, to adopt new technology preferring to rely on “proven reliable” protocols developed in a different era. With imperative mode systems, monitoring and operations is somewhat simpler. Because each configuration is explicitly defined or deliberately executed then the system is in a known (or better known) state. Thus configuring operating systems and storage arrays requires less monitoring. With declarative mode systems, we enter the realm of moral hazard. The most common form of moral hazard is in car insurance. Drivers without insurance drive much more carefully and have less accidents than drivers with insurance. The very act of insurance means that majority of the impact of an accident is transferred to insurance company who will pay for damage to your car and any third party. Its proven that car insurance increasing driving accidents and this creates adverse outcomes. 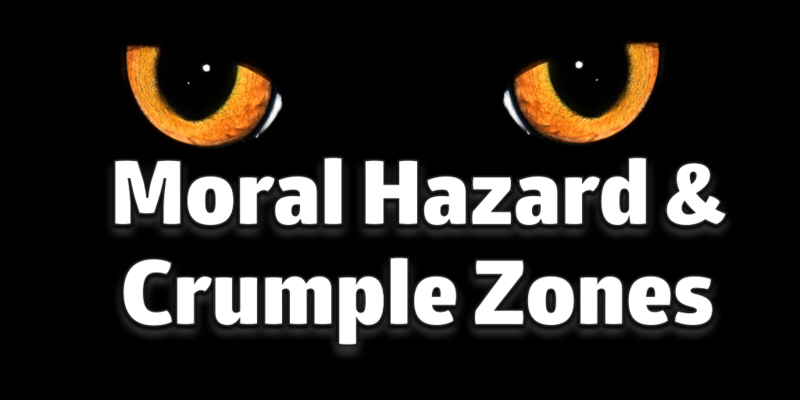 There are two parts to moral hazard – transfer of risk & adverse outcomes. The end-to-end reliability of networking is known to be poor therefore implementing redundancy is normal and most often mandatory. Indeed, redundancy is so common that the cost is rarely considered. The result is that we transferred the risk of failure to our autonomous protocols. So now we rely on these protocols to repair and sustain the connectivity of devices – risk is transferred. The adverse impact is that we focus all our efforts on design and protocols to sustain that redundancy. And thats why, I believe, we don’t monitor those networks. We have spent our efforts, money and time on implementing redundancy and building the illusion of imperative control. As a side note, we further compound the adverse effects through the use of command line. In one sense, the use of the command line give our human minds an illusion of imperative control when configuring our declarative protocols and devices. This illusion is a false sense of control, experienced engineers know that an network is, at best, partially controlled. That is, you can only hope that things work as expected but there are zero assurances. The network is often blamed when there is no obvious problem elsewhere in the system or infrastructure and the lack of networking monitoring means that refutation is impractical. It also doesn’t help that most IT professional are versed in imperative systems that “do exactly as I say and no more” do not comprehend declarative systems. This builds misguided perception is that a complex, autonomous system is highly likely to fail. In short, we do not have the ability to immediate confirm whether the network is at fault and network engineers become “moral crumple zones”. Any failure in the network is pointed to the engineer who take personal liability for the network instead of getting to the real cause. The most common causes of network failures are beyond the control of the engineer – vendor software bugs are common, hardware failures, power outages, WAN networks, faulty cables in the data centre, variable bandwidth consumption, dynamic endpoints are just some of uncontrolled factors in networking. Yet even while the plane is being run by software, the pilots in the cockpit are legally responsible for its operation. US Federal Aviation Administration (FAA) regulations specify this directly, and courts have consistently upheld it. So when something goes wrong, we observe pilots becoming “moral crumple zones”—largely totemic humans whose central role becomes soaking up fault, even if they had only partial control of the system. Most IT execs and CIOs are highly critical of their networks. 75 % of CIOs stated that the network is an issue that impacts their organizations ability to achieve its business goals. For almost a quarter, it is a ‘significant’ issue. The rise of Software Defined Networking(SDN) and its close companion Network Functions Virtualization(NFV) are changing the landscape for network operations and design. The primary change is that we see network devices as software instead of treating each network element as precious node of highly customised functionality. This software focus has renewed customer demand that network devices must be managed by software. Software network nodes can be disposable, fungible, elastic, replaceable. SDN means using automation tools to control devices and perform path management. In NFV, running network nodes in VMs mean that they can stopped, started, rolled back and upgrading with close to zero risk. These tools work for hardware devices too and vendors are racing to “software enable” their hardware products to avoid being left behind. The current generation of technology around Network Monitoring is genuinely bad. The best software standards for data interchange today are SNMP, Syslog, SSH. Vendors often use “screen scraping” of vendor consoles to get better data for the management platforms. And I’m tired of being the “moral crumple zone” whenever someone wants to blame my network. When we say “Its Not The Network” we must have the tools to easily prove it. The Mean Time to Resolution to the age old question “Is The Network OK?” must be automated. Don’t give up hope, Greg. There are lots of cool new white-box open solutions trying to fill the gap left by the failure of the IETF and IEEE. Unfortunately these beautiful boxes likely won’t work well together because no competent standards body is willing to help us with a common communication media between devices and monitoring, at least not while we have our Lord and Savior SNMP! I really liked the article, Greg. Is there a past comparable in networking technologies that was as revolutionizing as SDN and NFV appear to be? How long did it take to get massively adopted?